The resolute King Vikramaditya climbed the primeval tree and brought down the cadaver into which Bhethala invoked. As soon as the King started his journey carrying the corpse on his shoulder the Bhethala in the dead body started speaking to him. Hey King of Kings! Vikramaditya! To ease your journey, I will narrate you a story. Once upon a time, King Surasena ruled a kingdom by name Vidhyadhara. He married a most beautiful lady, Rathna Rekha and was ruling his place in all comfort and peace. Surasena was a well-learnt man and regarded as a strict disciplined king. One day a man came to Surasena's court and pleaded him to provide an employment in the kingdom. He introduced himself as Dheerasena. King gazed at him closely and asked, Who are you? Where are you from? Why had you come here? What work can you do? My Lord! I belong to Kalingapuri. There, I was a Commander in the King's forces Dheerasena continued saying, Along with my family I migrated as our kingdom was captured by an invader. King Surasena was pleased with the reply. Presently, there are four commanders working for me. Hhhmmm... I'm appointing you as force's trainer; right from tomorrow you can join your duties. Dheerasena acknowledged the kindness of the King, Mercy My Lord! In the full court of King Surasena, Dheerasena pledged to the King, In case, if there is any threat to your life Oh My King! I promise to save your life sacrificing mine. 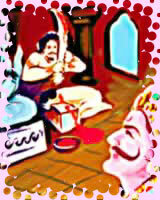 King Surasena was delighted with the commitment of Dheerasena. Dheerasena started training the army men with all his potential and gradually turned them to be great warriors in a short period. He was being paid 500 Varahas (ancient currency terminology) during that time. Intelligence sleuths shadowed him and were keeping the King informed about the movements, behaviour and all other information about Dheerasena. King Surasena at one time was puzzled to know through the sleuths that Dheerasena was feeding his family with 100 Varahas. The rest, according to the information, equally being distributed for development of Brahmin Agraharam (Locality where Brahmin community live in) and for poor and downtrodden people in Sudra Waada (Locality where Dalit community live in). The concern of Dheerasena towards poor pleased the King very much. He reviewed and thought over the situation. The King elevated Dheerasena's position from trainer and appointed him as personal security chief besides doubling his wage. Time was passing by like this. One midnight, the King suddenly got up from the bed, on hearing a woman weeping loudly. Dheerasena observed the King to wakeup so suddenly and reached him, to enquire whether some thing was needed. Dheerasena! Are you hearing the sobs? Go immediately and find out the reason for her suffering! King Surasena ordered. Spontaneously Dheerasena obeyed the orders, As you please My King! and left. Surasena followed him in a camouflage. Dheerasena walked towards the Northern side of the town to find out whom and why are they crying. He felt that the blubber was from within a temple nearby and walked into it. For his dismay, Dheerasena, noticed that the Holy deity's idol in the temple was weeping. He first bowed with respect to the deity and asked, Oh Mother! Why are you weeping? Can you please tell me the reason? Son! replied the Goddess. I'm Goddess of the Kingdom. The King would face a big problem very soon. As I am unable to trace some one who can avert that, I could not stop myself from weeping the Goddess lamented. At once Dheerasena pleaded the Goddess, Mother! With your blessings, I can save the King and avert his trouble. Please tell me what should be done. Sacrifice, Goddess replied, A brave warrior should sacrifice his lone son, to protect the King. Is that so then Mother I will sacrifice my son for the purpose of saving the King. I will be happy if the King is all in one piece, Dheerasena promised the Goddess and headed home. On reaching there, he woke up his wife Sulochana and explained her briefly about the incident. He thought Suvarnika cannot sustain the shock and she cannot live with out Karthikeya. Unable to bear the pressure, Vikramasimha drew his sword in agony and his head was rolling near the feet of the idol, a few seconds later. You perform what is righteous, wife said. You always followed the right path and I never objected for that. Even today, I will follow and respect your decisions. If my son's sacrifice protects the King, what more do we need? Please go ahead! Sulochana consented. Both of them made their son wake. They explained him, Son, we wish to sacrifice you to the Goddess for protecting the King. And asked, what is your opinion. Without any hesitation Son replied, Well Father! For the well-being of the King I'm ready to die. Parents loved their son for the last time and took him to the temple. Dheerasena sacrificed his son to the Goddess in front of the idol. Sulochana could not sustain on seeing the horrible scene and fell dead. Dheerasena could not control his emotion after his wife fell on the ground. Hey Mother! You just wanted my son as sacrifice to save the King. But, you took my wife's life too. Dheerasena yelled, The King is safe now. For whom should I live, when I lost my wife and son? Take my life too and cut off his head before the Goddess with his sword. King Surasena, closely following Dheerasena and watching every incident fluttered. He could not digest the fact that three persons died for him and his safety. Immediately he drew his sword and raised it to severe his head praying the Goddess, Jai Mahakali! A thunderous Stop King! was heard. The Goddess appeared before Surasena. Bowing before the Mother he saluted, Oh Great Goddess, respects to you. Goddess blessing him, I'm convinced with your duty mindedness and sacrificing attitude. Ask for a boon. Indicating towards the dead, Surasena pleaded, Enliven these three, Mother! Goddess bestowed the boon and disappeared. Dheerasena, Sulochana and their son raised from the pool of blood, as if they just woke from a good sleep. The next morning, King Surasena detailed the total episode to the people and courtiers. Appreciating the family's unparallel sacrifice King rewarded them and appointed Dheerasena as chief of the forces. Bhethala stopped his story and questioned, King Vikramaditya, you heard the story. Whose sacrifice can be considered as greatest? Dheerasena, Sulochana, their son or King Surasena? King Vikramaditya started speaking, Bhethala! King Surasena's attempt to severe his head should be considered as greatest. This is due; Dheerasena was an employee of the King. His sacrifice was part of protecting the King and the kingdom. Sulochana followed her husband's order. Their son sacrificed his life obeying his parents' command. Vikramaditya continued, King Surasena attempted to sacrifice his life as he was unable to bear the brunt of the sacrifices done by Dheerasena, his wife and son. Bhethala was convinced with Vikramaditya's reply and zoomed off with the corpse back to the tree-top.